The trees around the public open-air bath "Kojin-no-yu" at Tochio-Onsen area are decorated with about bulbs. The scenery is very fantastic. The light of the illumination is reflected on pure white snow, and it is enclosed by the gentle light around. A frozen waterfall of the famous "Taruma Water" of Shin-Hirayu-Onsen is lit up to create a magical scene for your enjoyment. 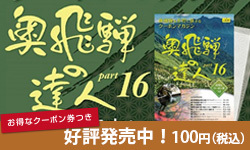 From mid to late January, the special event of Taruma-no-monogatari (tale of Taruma) is held. The warm and welcoming traditional gassho-style cottage Taruma-no-yakata is the venue for the magnificent winter Ema Market. Warm drinks and alcoholic beverages are also sold at the "ice bar" set up for the event. Within the mountains of the Fukuji Onsen area stands the “Fukuji Wall” rock face. As water seeps from the rock face it freezes into columns of blue ice, known as Aodaru. These columns of blue ice are recreated in the hot spring town. In daytime the columns are a beautiful clear blue, and at night they are lit up to create an even more magical scene. From early to mid February you can enjoy special events such as the “Ice Path Light-up”, that allows you to walk behind the Aodaru, and demonstrations of the local performing art of the Henbetori lion dance. 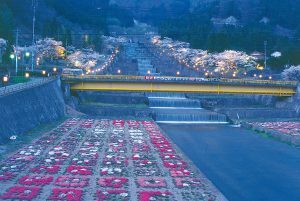 The Kamakura Festival is held in the Nakao-Kogen Highlands of Shin-Hotaka-Onsen. Each year about 7 snow huts (kamakura) of varying sizes are built around the venue. Each snow hut varies in its own way, with some housing warm hearths or drink bars (so-called “kamakura bars”). During the event period visitors can enjoy various activities on different days, such as participating in rice cake making or seeing the local performing art of the Meoto Jishi (husband & wife lion) dance. Enjoy a fun spectacle under the starlit sky. 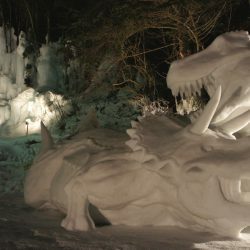 Snow sculpture contest is a famous winter event held throughout Okuhida-Onsengo. Each year several dozen splendid works of snow and ice are displayed along the streets of the hot spring town. You can see many sculptures of various subjects, such as the zodiac animal of the year and recently popular characters.